Hello Good People who read this blog whether you got here on purpose or by accident you are all welcome! My rambling blog is going to attempt at some form of confused continuity by continuing my stories of drug dealers . Please refer to my calendar on the right and click on June the 27th to read the first part of these tales. (time-compressed-in-my-brain) x (imagination + fantasies) x % ^ (the fact I was very stoned at the time). However if only you knew the stuff I left out, that’s far wilder, so anything innacurate will not be an exageration, if indeed I get to tell that stuff in this post. So if you read my entry (27/6/08) you’ll know that via my friend who was looking for a party we found a house full of drug dealers living above a sport’s shop in Harrow Road . At last we had found a regular place to score that did not involve dealing with brawls in pubs or hanging out in All Saint’s Road. I had concepts of dodgy drug dealers before I met these guys. This was in 1979 and all I can say is that from our point of view it was the happiest household I’d ever been to. The first people we got to know through my partying friend were two guys called Tony from Northern Ireland. They were either from Ulster or Belfast I cannot remember, but I do remember that due to the amount of bombings going on, the general stereotype was that anyone with a strong northern Irish accent was feared as a bomber. This was because each time there was a bomb , on the news they would always conclude by saying “and someone with a strong Irish accent phoned up to claim the IRA were responsible”. The IRA also were involved in some kind of drug smuggling but there was no way these two young men with strong Northern Irish accents were at all interested in bombing anyone or in politics either , they were only interested in getting stoned, having a laugh and listening to good music. One of the Tonys had a sweet young face, always smiling he had a drum kit in his room and I had my first go on drums thanks to him. I was rubbish and realised drums were not for me. He played them pretty well though. His taller friend, also a Tony, had long black hair with wrigglets and a moustache, he looked altogether wilder and people teased him by saying he looked like one of the Fabulous Furry Freak brothers ( the one with the glasses…what was his name? Phineas Freakears!). Both Tonys were friendly guys with a great sense of humour. In fact I seem to remember we christened a fair few of our friends at that time according to different characters from that comic it was so funny and tragic at the same time. The new obscenity laws that dear old Thatcher brought in meant the nice people at the headshop in Portobello Road were busted several times for selling “Fabulous Furry Freak Brother ” comics. I bought a board game from that head shop back in 1980 ( the shop still exists, called “Alchemy” it changed address though). It was a board game called “Dealer Mc Dope” ( this photo is from the Last Gasp website where you can still buy this game from!). It was like Monopoly except you have to go around the world buying and selling drugs . 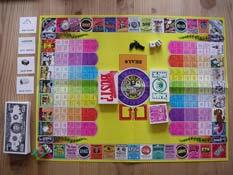 It takes several days to win and some of the rules are quite insane and humanly impossible. I seem to remember there were 2 sets of rules one was the “Perverto Insane rules” or something involving cannabalism and nuclear explosions or similar . The cartoons on the banknotes are fantastic with Ronald Reagan and other American politicians. Anyway I bought that from that same headshop in 1980 and they had to keep it under the counter for me in case they got busted for selling a drug dealing game. 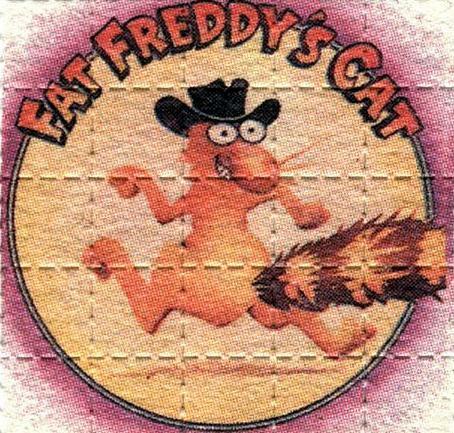 My favourite was always Fat Freddy’s Cat and because we had a large number of cats at home , we frequently referred ( or should I say reefer-d..very bad pun!) to the philosophy and wisdom of Fat Freddy’s Cat. He used to poo in Fat Freddy’s cowboy boots to remind him that the catbox needed changing and ours used to poo everywhere too… aah! Happy Days! Around then there were various cinemas that catered for hippies , late night tokers and those interested in counterculture films. It was through these that we encountered Fritz the Cat. A pornographic debauched cat I didn’t much like, still it certainly turned the stereotypes of cartoons like Mickey Mouse and Felix the Cat upside down. In Notting Hill the Electric Cinema had late night shows where I remember watching “La Vallée Obscured by Clouds“. Pink Floyd had provided the music but one of the characters (Monique) is also played by Miquette Giraudy of System 7. However in this clip she is a bit er… obscured by clouds but that’s her in the red/brown cape or possibly blanket. On the same bill was “More” also with some music from Pink Floyd. Both films were directed by Barbet Schroeder. I seem to remember that “More” was one of the most depressing junkie films I had ever seen. Mind you I don’t remember a lot about it except that I got bored . I much preferred “La Vallée” which had a more interesting story of hippies trying to reach a place and way of life before the trappings of modern culture and capitalism. In this clip of “More” from youtube below they have censored some of the ingredients to their spaced out drug concoction……sorry ! I might have to write another entry just about films and alternative cinema because I can sense another 1500 words about to emerge. 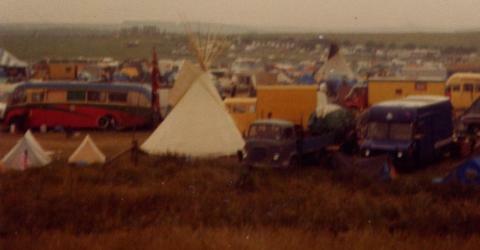 I cannot forget the first time I saw ” Up in Smoke” in the late summer of 1979 . I was alone in Paris at the time, I had a place at The Sorbonne to study French but I was desperately lonely , broke, and had nowhere to live. I ended up going to stay in a convent in the Latin Quarter. I went to the cinema every day to hear some spoken English as I was very homesick and I came across ” Up in Smoke ” by accident , I had never seen anything like it . Cheech and Chong playing two bumbling American hippies in the most hilarious film I had ever seen, going through every young toker’s scenario . I went back to the cinema to see it several times until I just had to leave Paris where I was desperately miserable and rejoin my hippie boyfriend and friends back in London leaving my University course behind…. but I never regretted it and studied later on a course I was much more suited to. 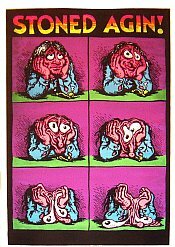 Cheech and Chong were almost like cartoon characters, also there was Robert Crumb and the Stoned Agin posters. The bedsits over the Sport’s shop in Harrow Road were full of young small time dealers, who actually were just like Cheech and Chong and had all the stereotype posters on their walls. The Stoned Agin one , then there was the multicoloured one of a woman smoking a great big cone spliff, plus of course Bob Marley , Jimi Hendrix and other bands. We’d spend the evening there and have tea and munchies and lots of spliffs. There were sometimes other drugs there but we didn’t generally bother with those, I certainly was not interested in other drugs at all. There was quite a range of different types of cannabis available and the different varieties of dope available improved when eventually we got to know their dealers, and their dealer’s dealers! But for a year or so we hung out happily at the Sport’s shop and got to know the other inhabitants who all were smiley jolly people and seemed eager to be our friends and tell us of the latest attempts by the police to have them busted. Dope was cheap, much cheaper than beer and made me happy, not aggressive or miserable like alcohol could. Plus it made me feel good about being creative and someone who liked to think about society as the entire drug culture was about using drugs to expand the mind and to create new music and other artistic and intellectual pursuits. I think I personally wanted the spiritual ecstatic experience that religion alluded to ( being filled with the Holy Ghost!) but just didn’t deliver. I wanted to feel at one with the planet, with all living things and that life was special and had a purpose. I think I found this through dope temporarily at least although I think the company and culture associated with drug-taking was equally important. Still I find most people are walking contradictions including myself. In those days we all thought that dope was not only healthy but good for you, cured asthma, arthritis, annorexia, depression, and that is why we supported the “legalise cannabis campaign” and were willing to risk getting arrested at Smokey Bear’s Picnics in Hyde Park and other legalise cannabis events. My thoughts and feelings about dope are totally different now and today’s skunk is a totally different drug. Skunk has wrecked the mental health of at least one of my friends. Also we now have the knowledge that smoking anything gives you cancer…is ignorance bliss? or just foolish? or were we just young and some of us finding life very stressful and alienating without dope and the good company of other smokers? It was bliss back then to smoke dope and feel that it was revolutionary, wise, naughty and illegal as well as a healthy herb and it separated us from “straight” people who liked to drink lots. It was very “us” and “them”. I’ll write more soon. At my leisure! Please tell me in a comment if you had any dope smoker’s posters on your wall or other paraphenelia I may have forgotten about . 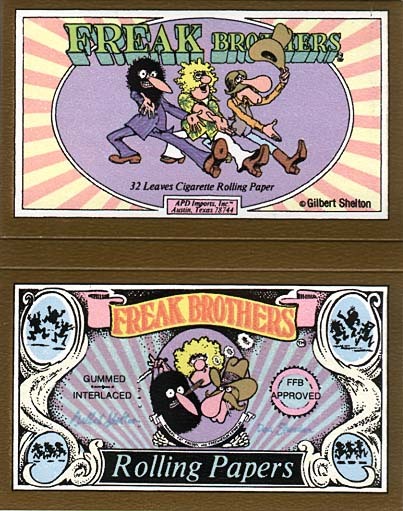 How about unusual cigarette papers? Like there were dollar bill ones and pink leopard-skin skins. and do you smile each time you watch the BBC London news read by Rizzla Teeth? I do! Yes..the dope-smoking culture and sense of humour doesn’t go away even if writing blogs has replaced the hours of giggling and listening to Gong while smoking bongs. Happy Days! Lots of things from the US in this entry and I’ll finish with a trailer from the film Psych-out ( 1968 ) see below this paragraph . It’s an absolutely brilliant little montage of this crazy colourful film. I first went to see this at The Scala in King’s Cross as part of an all-nighter with my ex and our mate Gid who was 6 foot 4 and had his face painted as a mouse. They were both tripping from dope cake and totally freaked out from seeing this cautionary film and I had to try and chill them out after the film by finding them munchies and talking to them about nice things. It was quite difficult not to smile , Gid looked very sweet as a 6 foot 4 inch terrified long-haired hippie mouse with a little red nose and painted whiskers across his cheeks.